Promise can reveal itself in many shapes and forms, and youngsters and relative newcomers Dan Knights, Ed Neal, Billy McKay and Alex Sutcliffe present it in the shape of Armadillo. At just 19 years of age the band may seem to have plenty of time to risk their fortunes on the rock ’n’ roll lottery but, as the old adage goes, you never get a second chance to make a first impression, and so they’ve come out all guns blazing with this, their self-titled debut album. Eight tracks in 42 minutes indicates either a progressive or leadfoot approach to things, and indeed this Colchester-based quartet do tend to take up the slow and grinding path; like the band’s namesake ‘Armadillo’ is a hard and heavy beast, and at times equally difficult to penetrate, with deep, demanding riffs calling to mind at times the early days of Black Sabbath. There’s a preponderance of instrumentals – a result of the only attracting vocalist McKay to the fold late in the day – which does give the album a slightly unbalanced feel, but those three tracks to at least allow guitarist Knights, bassist Neal and drummer Sutcliffe (three old friends who originally put the band together at school) the space to show off their own not inconsiderable talents. With the introduction of McKay’s vocals the material takes on the air of 1990s’ Corrosion Of Conformity – which is no bad thing in itself – but that’s not to say that Armadillo are just treading a well-worn path. This is an expansive and engaging album, and one which contrasts the likes of opener ‘Satan’s Baby’, a lumbering behemoth of a song (although check out the change in tempo around the three-and-a-half minutes mark which for a short time roams in Metallica territory) with ‘Revolt Of The Cockroach People’, the track which immediately follows on and which features a funky and unforgettable refrain seemingly a million miles from its predecessor. And the whole thing winds up with the supercharged ‘Hot ‘N’ Spicy’ which is done and dusted in just over a minute. Epic in execution, ‘Armadillo’ should, if there’s any justice in the world, start turning a few heads, and by all accounts the band have already made a name for themselves as a great live act. And apparently album number two is pretty much already in the can and set for an early 2016 release. 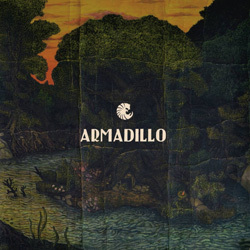 In the meantime, however, ‘Armadillo’ is available to stream or download from armadillobeef.bandcamp.com, and for more information about the band email armadillobeef@gmail.com ; a limited edition vinyl pressing of this exciting debut may be in the offing, so be smart and flag up your interest now.